Fresh green tomato sauce prepared with green tomatoes, hot pepper, olive oil and oregano makes pasta and sandwiches irresistible. 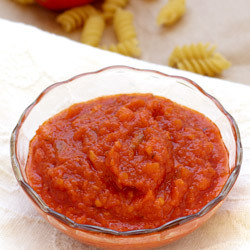 Use it as a dip for bread stick, spread for sandwich or garnishing for pasta, its surely going to tantalize your taste buds. Heat 2 tablespoons olive oil in a non-stick saucepan and sauté garlic over medium heat for 30 seconds. Add chopped green tomatoes, green hot pepper and salt in it and sauté over low-medium heat for 2-3 minutes. If you like a spicy taste, then add more green hot peppers. Add 1/2 cup water and cook covered over low to medium heat until tomatoes become soft and tender or for around 8-10 minutes. Stir in between frequently. Turn off heat and carefully transfer it to a blender. Blend and make a smooth puree. Transfer puree into a saucepan. Mix dried oregano and ground black pepper. Cook on low-medium heat until it becomes thick or for around 4-5 minutes. Remove saucepan from heat source and transfer prepared green tomato sauce to a bowl. Add fresh or dried basil along with tomatoes for a nice flavor. Serving Ideas: Serve it over cooked pasta. You can also enjoy it as a tangy dip with nachos and bread sticks.